Cylindrical enlarger male / female? Home / Cylindrical enlarger male / female? Material: ? 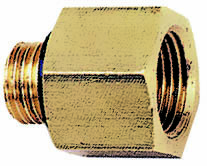 2.0401 Temperature min -20 °C – max 80 °C Max pressure 1/8 to 1/2 : 200 bars, 3/4 and 1″ : 150 bars, 1″1/4 to 2″ : 100 bars.